Despite the fact I have now lived in Sweden for six years, I still have not adjusted to the reality that summer can be downright cold. It hovered in the low 60s for much longer than I appreciated, and then suddenly we had three weeks of temperatures that reached up to the 80s. It was a welcome change, but since the weather can swing like a pendulum from day to day, it’s nice to have some options for soup that work served either warm, or cold. 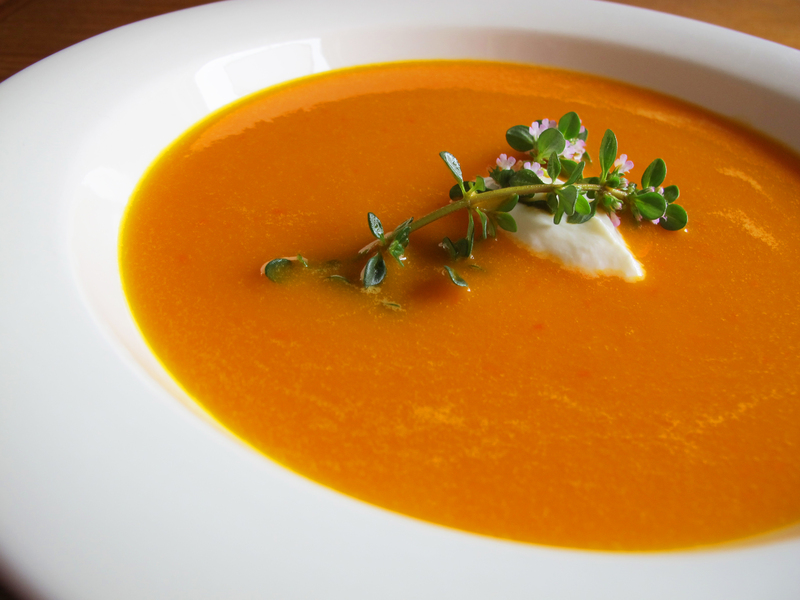 This easy-to-make soup made from bell peppers fits the bill. This happens to be one of five-year old’s favorite meals and she always requests the leftovers for breakfast. Before I give the impression that this is magic soup for children, I should mention that her 7-year old sister does not rave about it, but is keen enough to eat it without a fuss. Bell peppers are paprika (PAP-rik-uh) in Swedish, and the original recipe calls for green bell peppers. Since I tend to find them bitter, I prefer the taste and vibrant color that comes from using red, orange, or yellow peppers. Choose whatever suits your taste. Melt the butter in a large pot and saute the chopped onions and peppers until soft. Add half of the chicken stock and bring to a simmer. Cover and cook for 10-15 minutes. Puree the soup in a blender or food processor and return it to the pot. Add the remaining chicken stock and cream. Heat through, and serve with a dollop of creme fraiche. SO NICE to see semiswede back again. Thanks. How about if I replace the chicken stock with a vegetable stock, or simple water? I am vegetarian. Do you think that would be good? I will try this out though – it looks simple and nice. I think that should work out fine with vegetable stock, although you may need to add a bit more vegetable stock. I think plain water would be too bland. Whatever you decide to try, I’d be interested to hear how it turned out! Thanks so much for all of the energy you put into your blog. I really enjoy the recipes, Swedish ‘lessons’ and comments. Keep them coming! Wishing you all things good! What a lovely comment. Thank you so much. I’m so glad to know you find the posts of interest. Wishing you all good things as well! I love your blog and am happy to see you are back. I missed them. They are beautiful as well as educational. Love the pepper sonup recipe! Julia in CT.
Just found your blog through pintrest love the lilac cordial idea. The more Swedish background you can give about your recipes etc. the better I attend an Evangelical Covenant Church in the U.S. a denomination that started in Sweden so we have many members of Swedish decent. Sadly traditions are often lost in the American mixing bowl and it is fun to rediscover that which has been lost.